When I was younger I often asked myself: "If you had to choose between the perfect body and the perfect skin, what would you opt for?" and funnily enough I've always held it with the perfect skin. Because I mean what's 10kg too much if you don't have cellulite? And what's an average pretty face if you have a skin like a goddess? Maybe I'm just thinking that way because I had really bad skin in my teens (talking about some serious acne here) and still nowadays I'm rarely pimple-free. Luckily enough by now I know what works for my skin and what doesn't and these days I prefer products with the following 3 ingredients. Tea tree oil is said to kill bacteria why it's an ideal cleanser and spot fighter. However one must pay attention to the doses one applies as it might as well dry out the skin. Currently I'm using the Tea Tree Cool & Creamy Wash from The Body Shop but I don't apply it morning and evening as that would be too much of a good thing. Therefor I use it whenever I feel like my skin needs some deep cleansing like when I've been wearing lots of makeup throughout the day. If you have a more sensitive skin I would however recommend starting off with a more gentle product like for example Lush's Tea Tree Water which doesn't dry out the skin at all. Or if you just want to fight some occasional spots you might want to try The Body Shop's Tea Tree Blemish Gel or just some pure tea tree oil. I only discovered this wonder weapon recently but it's great to use on red spots as it reduces the inflammation. Therefor I'm using the Serozinc solution by La Roche-Posay which soothes the skin. Whenever I couldn't leave my fingers from a pimple I furthermore use some zinc ointment before going to bed, which allows the spots to heal and look way better the other day. Another product I recently discovered and wouldn't wanna miss in my beauty routine is the Catastrophe Cosmetic face mask by Lush. It contains Calamine powder, which is a zinc oxide, and the mask leaves my skin all soft, clean and radiant. This ingredient is really popular in face masks, too and is said to absorb grease and dirt. I'm currently using it in a fresh cleanser from Lush, namely the Angels On Bare Skin. There is also the possibility to get clay at your local pharmacy and mash up your own face mask. And in case you're too lazy: The Body Shop also offers a clay mask which furthermore contains seaweed (another ideal ingredient for clear skin). 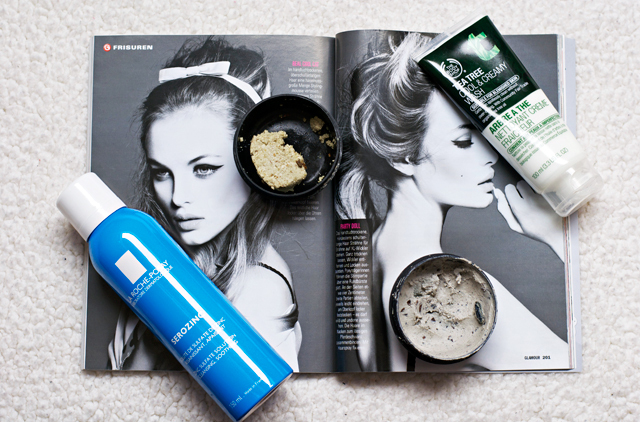 It's the Seaweed Ionic Clay Mask. Nice review. I must try Lush products. I might try some pure tea tree oil on my spots tonight! I forget how good it is at battling blemishes.